Popular video pinball game Timeshock! will soon have full video pinball cabinet support following Arcooda’s announcement on Tuesday that is has partnered with Barnstorm Games. 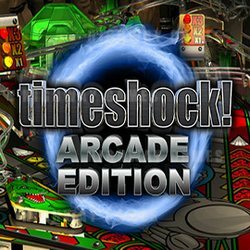 Barnstorm, the team behind popular video pinball game Pro Pinball: Timeshock!, and Arcooda have been working together to create Timeshock! - The Arcade Edition. It is the second partnership Arcooda has announced in the past three months. Arcooda partnered with FarSight Studios, creators of The Pinball Arcade, in December 2016. Together the two companies created Arcooda Pinball Arcade. Arcooda Pinball Arcade contains 70 video pinball games. This software is an advancement of The Pinball Arcade, tailored exclusively for Arcooda’s arcade and pinball machines. Barnstorm is the second company Arcooda have partnered with to enhance already well-known and loved video pinball games and make them compatible for full cabinet support. Arcooda described Timeshock! - The Arcade Edition as “an advanced and integrated video pinball cabinet version of the renowned Pro Pinball: Timeshock! video game”. Timeshock!, part of the four video pinball tables released between 1995 and 1999 through the Pro Pinball series, was a ground-breaking video pinball game that pioneered the genre. The Pro Pinball series has stood the test of time and is still regarded as one of the most realistic video pinball experiences in the market today. Timeshock! - The Arcade Edition has been specifically designed to work on Arcooda’s full-sized Arcooda Video Pinball machine. Many new features will be introduced to Timeshock! – The Arcade Edition including multi backglass display, multi-colour DMD, brand new lighting engine, pinball coils, shaker motors and other innovative video pinball cabinet support to bring new dynamism to the much loved pinball game. Additional game play features will also be added to Timeshock! - The Arcade Edition. “Pro Pinball is one of the premium titles available as a video pinball table with a rich history,” Steve Josifovski, Arcooda CEO, said. Timeshock! - The Arcade Edition will be available as an exclusive product on Arcooda Video Pinball and Touch Wizard arcade machine series. Arcooda will release two video pinball models in 2017, a home version product with at least 100 plus licensed game tables and a coin operated model with many innovative features yet seen on video pinball machines.